I can lose hours of my life trying out new business tools and software. Clearly, I am a geek. I’ll hear about something or see someone mention a shiny new tool and it’s hard for me to resist checking it out on the spot. And then spend time I ought to be doing something else just playing around trying to figure it out. My current shiny new tool is the Interact Quiz Maker, which, unsurprisingly, helps you make quizzes. Earlier this year I read a blog post by Kayla Hollatz, about email quizzes and how creating a quiz on her website helped to grow her business. I’m a bit cynical about quizzes (OK, I’m a lot cynical), because I really don’t believe Everyone Has "Mickey Ears" That Match Their Personality or that my life in 2019 can be predicted if I Plan A Special Meal. You might not believe it, but I’m not even tempted to answer some would-you-rather questions to “ Reveal Which Golden Girl Is Your Soulmate. (But if you are interested to know which Golden Girl is your soulmate then please a) read the rest of my post first then b) sit yourself down with a stiff drink - all but one of the Golden Girls are dead, and Betty White is nearly 97, so in theory not the best pick for if you’re looking for a mate for life 😉). But Kayla’s blog post about the value a quiz added to her business got me thinking that perhaps a quiz could be a win-win. Both a useful tool to help small business owners with their marketing and websites (which is what I try and do every day) and also great marketing tool to help me grow my business. And that’s all that happened for 6 months, I thought that that a quiz on my website might be a good idea. It was time to try a quiz. The timing was right, I thought it could be a good idea, it seemed a no-brainer, so I signed up for an Interact account. And then I didn’t even log in again. Client work built up and all of a sudden, the timing was wrong. So I put it off. Then I gave a presentation at our local business association on ‘Smart Websites’. Afterwards I realised that it would have useful if the attendees had completed a quiz before my presentation, to give them an idea of how well their websites were doing. To give them a sense of what they were doing well, and what they could improve on. This was my lightbulb moment - perhaps it would be useful for everyone to know how good their website is. So I logged back in to Interact, and then I was really embarrassed at how very easy it is to create a quiz. I should have done it weeks earlier. Part of the reason I had put it off was because I had assumed there would be a steep learning curve, but it’s actually really simple to put a good quiz together quickly. Note: Interact have a really comprehensive guide on the process but I like figuring out things myself first and didn’t read it till after I’d made my quiz. If you’re interested, you can read it here. STEP 1: TEMPLATE OR START FROM SCRATCH? This is what it looks like when you are ready to get started. You need to figure out whether you want to create a quiz based on an existing template, or create one from scratch. Because I hadn’t created a quiz before, I thought it would be easiest to use a template for my first quiz. I selected Business, Marketing and Technology as the templates I wanted to look at first. STEP 2: WHAT TYPE OF QUIZ? You can choose from Assessment quiz (like a test), Personality (which is what I used in the end and is not strictly speaking a personality type) or a Scored, where you can assign scores to each answer. As always, the first thing I like to do is make it look like my brand. If you know your brand colours then it takes less than a minute to get the quiz looking on brand. If you want to use your own image as the cover page and add your logo, then add another minute. Once the branding was sorted, I added my questions and played around with the order of questions until they flowed the way I wanted them to. Again, it was super-easy to manage in the back end, just a simple and drag and drop to move the questions around. Next I devised potential answers, and this is where I’ve tried to inject some personality and light-heartedness into the quiz. This was probably the most enjoyable part for me. The last part of the quiz creation was deciding on the results. It was good to have a look at other quizzes to get ideas of how they presented their results and that helped guide what my results should be. When I was happy with the results page, I mapped potential answers to final results. This was another reason I think I put off tackling creating a quiz, I assumed this part would take a lot of work. And once again, I was embarrassed that I got that part totally wrong. It took about 5 minutes and some clicking but that was all. The next step in the process is to figure out what you want people to do once they’ve submitted their answers. As someone who has abandoned quizzes before when forced to give my email address to get the results, it was really important to me that people could get results without needing to use their email address. I still want people to know whether they are getting the basics of their website right even if they don’t want to go on my email list. Enabling this is a simple setting when you are setting up your opt-in form. Finally, it was a 5-minute job to embed the quiz to my website (view instructions for all website types) and to create a bar along my home page to direct site visitors to the quiz. It was important to me from the very start that if I were to have a quiz on my website, that I didn’t want it to be a fluffy, trivial, time-killing quiz, but something that legitimately could help people with websites know what changes they could make to get a better website. I wish I had known sooner that creating the quiz would be easy, and take way less time than I had anticipated. Next steps are to promote the quiz on my social media channels and to be able to measure the results. Stay tuned for an update in a few months’ time. 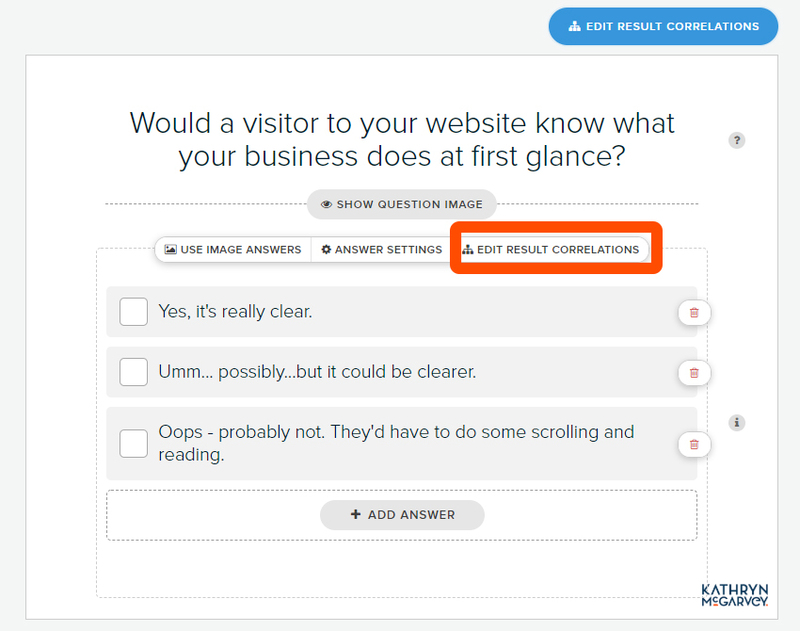 If you haven’t already, you can take the quiz here and see whether your website passes muster. Good luck, and if you need any help with your website, then do get in touch, I’d love to see whether I can help you smarten your website up. And thanks to the good folk at Interact who challenged me to try their service out. I’m pleased you made contact and look forward to reporting back my results in a few months.